If you happened to play the original Chime, Chime Sharp is more of the same but with a few new modes. That’s not a bad thing – the original was already great – but it’s enough to help you decide whether Chime Sharp is for you. If you haven’t played Chime before, Sharp’s a good a place as any to see what it’s all about. Its new modes play with the Chime formula in some fun ways, emphasizing the puzzle aspect, while the expanded soundtrack adds a lot of variety both in music and gameplay, making it a far superior game to its predecessor. For the uninitiated, Chime works like this: You place blocks on a large grid and attempt to make quads – 3×3 clusters of blocks – to gain coverage of the board. Every tile caught in a quad’s reach lights up, marking it as claimed. The beatline then moves across the screen and clears the quads from the board with each pass. Every time a quad is cleared, the music adds a new verse, evolving more and more as you play. The goal is to cover as much of the board as possible while earning the highest score possible. How you go about achieving those goals differs between modes. In standard, it’s regular ol’ Chime. You have two minutes to cover as much of the board as you can before time expires. Performing well nets you additional time, though you have to move fast to keep countdown alive. Sharp removes the timer and emphasizes the puzzle aspect. Here your focus is to make perfect quads – that is, quads with no fragments hanging off them – for each fragment left behind takes away one of your ten lives. Strike is simply a faster version of the standard mode, with a shorter time limit (90 seconds) and a faster beatline to help you pick up the pace. Fragments also take away any claimed tiles. And Challenge reverts the game to original Chime’s design by splitting the board into a bunch of smaller segments while also giving you a limited set of blocks to work with. 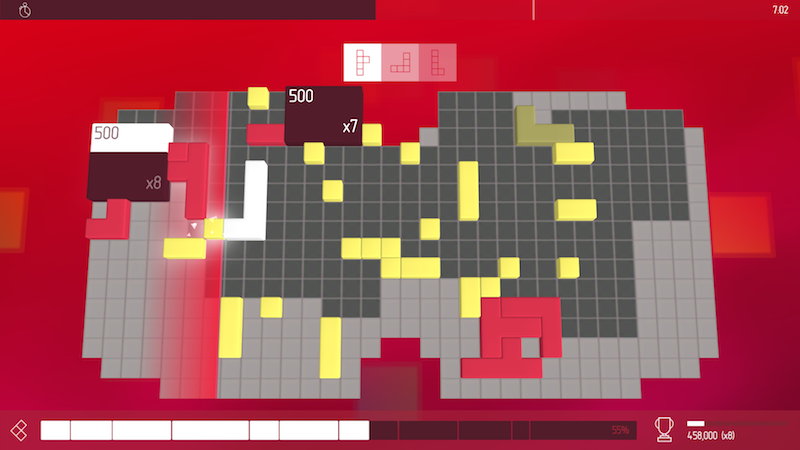 Fragments both help and hinder your ability to gain coverage, depending on which mode you’re playing. Unlocking of each of these modes generally requires you to gain at least 60% coverage of the board, with Challenge requiring 90%. Easy enough to achieve, with the exception of Challenge, as almost completing an entire board is no simple task. Just building quads is easy. Gaining coverage isn’t. The pieces rarely fit together neatly, which already makes assembling quads difficult enough, and doing so under the pressure of a time limit only makes it harder since you’re more prone to mistakes. Still, there’s some fun to be had in the sprint to form quads as quickly as possible. Once you start getting a sense of what blocks pair well with other, strategies begin to develop. I often ended up trying to build two or more quads on opposite sides of the board once I got the hang of things, or trying to extend a single quad across the board for maximum coverage. It’s a game built on being easy to understand but hard as heck to master. The game’s soundtrack has a heavy focus on electronica from artists like Chvrches, Magic Sword, Chipzel, and more. It’s a good selection of songs, each supporting the frantic pace of Chime’s gameplay nicely by steadily becoming more energetic as new verses play with every pass of the beatline. Each song has their own board and set of blocks, making the act of play differ greatly for each stage. Replacing a single block can already change how you need to approach that level. Tossing different boards on top of that only makes things that much more interesting. Leaderboards act as the main draw, but for me, just sitting back and making music was satisfying enough to keep me coming back. I always like it when games incorporate music into their gameplay, and Chime Sharp’s fantastic blend of puzzle solving and music creation makes for a splendid time.